I run a Mobile Car/Van/Minibus Valeting Service covering Weston super Mare, Burnham and North Somerset areas. All the valets are done by myself in order to maintain consistently high standards. 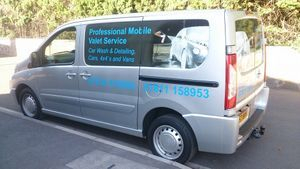 This service is mobile so I would come to you, or alternatively, if it is easier, you can have the valet done in St Georges, Weston. I offer 4 valets, although these can be tailored to suit your requirements. These prices and durations are approximate as the size of the vehicle, your location and the condition of the vehicle can affect the time it takes to valet the vehicle and get to your location. In order to give you an accurate quote I will need to know what valet you require, your location, make and model of vehicle and the condition of the vehicle ie pet hair, sand etc. IF YOU WOULD LIKE FURTHER INFORMATION, PLEASE EMAIL OR CALL ADVISING THE LOCATION FOR YOUR VALET, VEHICLE DETAILS AND WHICH VALET YOU REQUIRE. All areas of Weston super Mare - Worle, St Georges, Kewstoke, Banwell, Bleadon, Uphill, Brean, Berrow, Burnham on Sea, Highbridge, Cheddar, Mark, Blackford, Wedmore, Crickham, Brent Knoll, East Brent, Lympsham, Hutton, Loxton, Locking, Badgworth, Weare, Axbridge, Blagdon, Shipham, Langford, Redhill, Churchill, Wrington, Sandford, Congresbury, Cleeve, Claverham, Backwell, Long Ashton, Flax Bourton, Barrow Gurney, Failand, Yatton, Wraxall, Tickenham, Easton-in-Gordano, Pill, Portishead, Clevedon, Kingston Seymour, Kenn, Nailsea, Winscombe and any other areas within reasonable distance from Weston super Mare.